Slow Cooker Beef Roast and Vegetables. 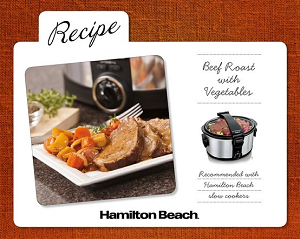 Hamilton Beach has been nice enough to share some slow cooker recipes with us. I can’t wait to give this first one a try. Season roast beef with salt and pepper. Heat olive oil over medium heat in deep skillet or stovetop safe slow cooker vessel on stovetop. Brown roast well on all sides. Remove from heat, remove roast from cookware and set aside. Place onion and garlic in cookware and brown lightly with residual heat from cookware. Transfer onion and garlic to slow cooker base and place roast on top of onion and garlic (or simply place meat on top of onion mixture if using stovetop safe slow cooker vessel). Surround roast with potatoes and carrots. Pour beef broth over all and top with sprigs of thyme. Cover and place cookware in base. Cook on LOW for 8 hours or HIGH for 4 hours. Remove roast to serving platter. Disgard thyme sprigs. Using slotted spoon arrange vegetables around roast. Cover with foil to keep warm. 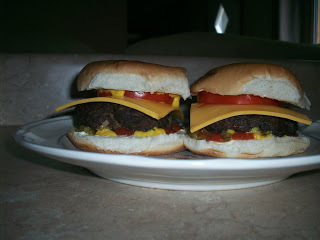 Original recipe can be found here along with nutritional information.